Very often in electronics you would need to measure temperature, not just in one spot, but simultaneously in two or more spots. And log that measurements, so that you can plot temperature change over time. 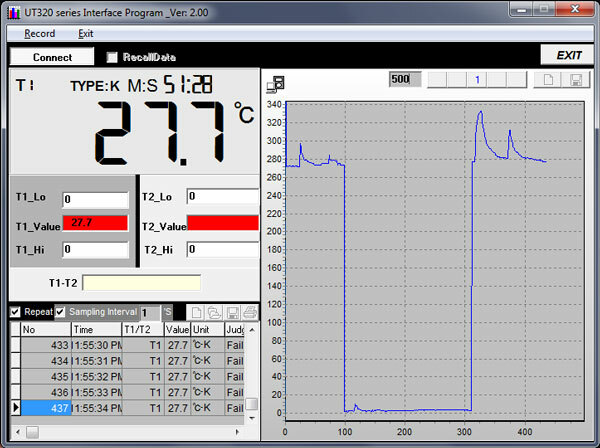 Also, differential temperature measurements could be extremely useful in some cases, especially for thermal design of electronic projects. 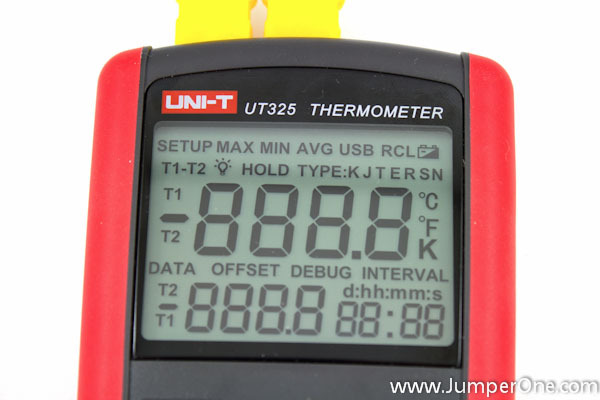 So, the other day I bought this UNI-T UT325 dual-channel logging thermometer for a little under $80. ..review of another weird Chinese product below.. The thermometer came with two very cheap thermocouples (but what you expect for $80? ), USB cable, CD with software and printed manual. As you can see it can work with almost all thermocouple types. But it’s accuracy is specified in pretty narrow ambient temperature and measured temperature windows. 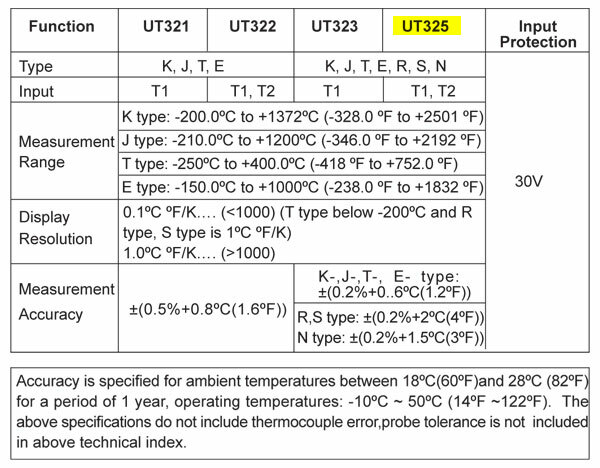 I think it’s because it doesn’t have any temperature lookup table for thermocouples. And maybe some poor processing of readings from internal NTC temperature sensor. Unfortunately I don’t have any precision thermometer to check if the claimed accuracy is true or not. The device feels really solid, just like a brick. But it is also very light, which is kind of unusual for such a firmly built case. It has really big and nice display, which can simultaneously display temperatures from both thermocouples or temperature from one of the thermocouples and the differential temperature(difference in temperatures between two thermocouples). Also backlight is nice too. 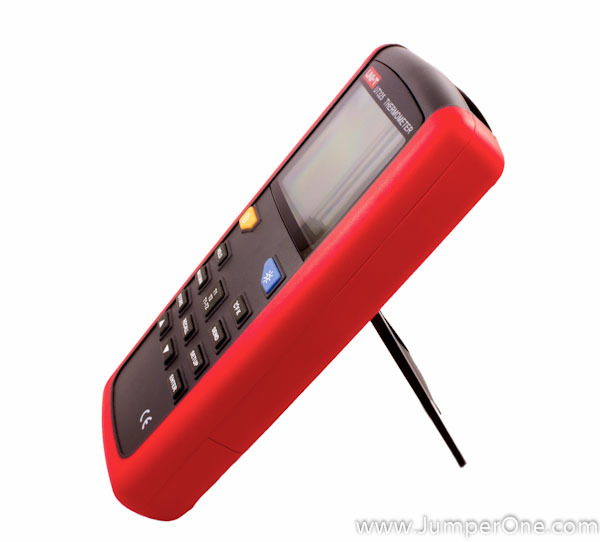 What is a bit unusual for such a device is that instead of membrane keyboard it has real tactile buttons. At first it feels really nice, to have some tactile response, but then if you need to press one button multiple times, it could get a little annoying. But anyways, the keyboard is pretty good. However it’s responsiveness could be much better. 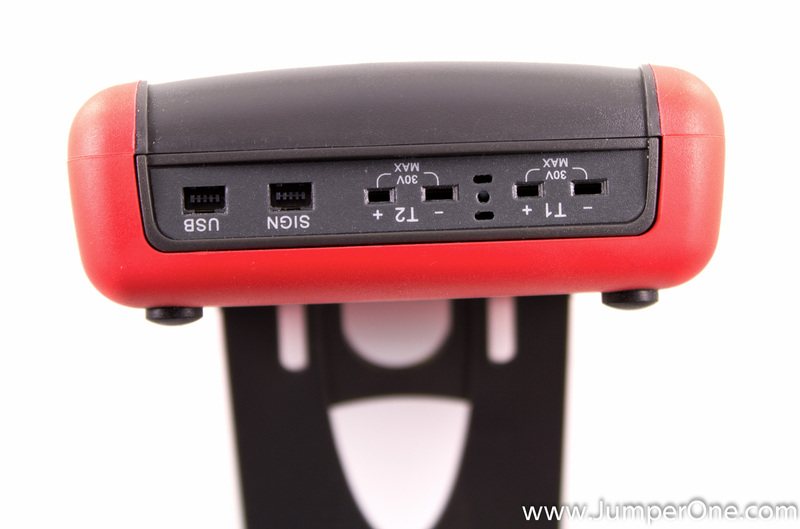 On the top it has two inputs for thermocouples, ventilation holes for internal NTC temperature sensor (between thermocouple inputs), USB connector and signal output connector. But the tilting bail on the back is just awful. No, it’s holding thermometer on the bench just fine, but when you try to open it, it’s almost impossible to do using fingers, especially if you got a big fingers (which I’m not). C’mon UNI-T! On my another UNI-T product – UT61E multimeter the tilting bail is awesome. Why don’t you just use that tilting bail design? First of all – the simple real-time temperature measurements. In that respect it doing it’s job just fine. The thermometer can show you temperatures from both thermocouples simultaneously on it’s big display. By using big square button in the middle you can switch between a few temperature display modes: reading from thermocouple 1 (T1) on the top and T2 on the bottom, T2 on the top and T1 on the bottom, differential temperature on the top and one of (T1 or T2) temperature readings on the bottom. MinMax function is working properly too, but only for top display (for whichever temperature is displayed). Using CFK button you can switch between degrees Celsius, Fahrenheit, and Kelvin. In the SetUp menu, which is kind of like main menu for this device, you can set a number of different options and turn on some functions. For example, you can adjust the temperature offset for thermocouples to compensate for thermocouple error; you can set the logging interval, the time (minutes and seconds only), select types of thermocouples used, turn off the cold junction temperature compensation(turn off NTC), set temperature limits and type of alarm used (audiable or signal output). If you using this thermometer as a part of some automated system, then temperature limits function with signal output would be really helpful. You can set the LOW and HIGH temperature limits and then when temperature goes past one of the limits – the audio alarm will turn on. Or, instead of sound alarm, you can choose the signal output. If temperature goes higher than HIGH limit, then on one of the signal pins of the SIGN output you’ll get +3.5V in relation to ground. If temperature would be lower than LOW limit, then the SIGN output will switch on and off with 10Hz frequency and 30% duty-cycle. Now here starts the most interesting part! It’s said, that it’s a logging thermometer – and it’s true. But if you think, that it will record readings from both of the channels – that’s where you wrong. 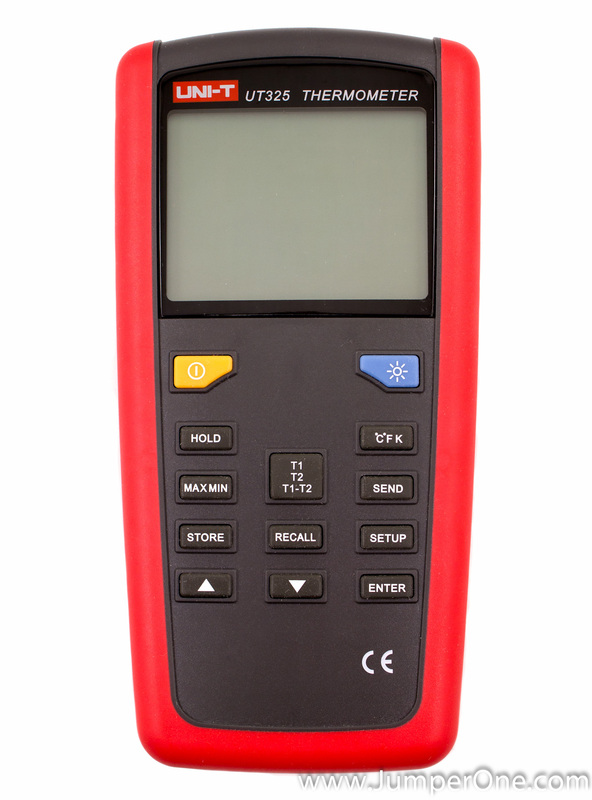 It can record readings only from one channel or differential temperature. Well, basically, it stores in memory the upper value from the display, whatever it is. You can either manually store values into memory, or set-up a logging interval between 1 second and 60 minutes. And it can store only 100 readings, which is not too much at all. But hey, that’s not all surprises! You can think, yeah, OK, I’ll use it only in a lab environment and will use PC to log all the data – wrong again! Software that came with this thermometer is only capable of reading one measurement at a time! You can’t see or log readings from T1 and T2 simultaneously! It’s completely worthless! 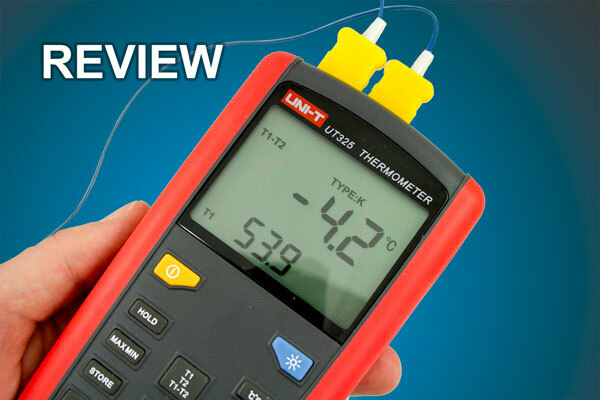 It seems, that this thermometer sends only contents of upper temperature display plus information which thermocouple is this and measurement units. However, in teardown you’ll see, that it’s hardware is more than capable of sending both readings over USB to PC. It’s just very poorly written software, that messes up everything. But hardware itself is surprisingly good. If you need only to take a real-time temperature measurements from both temperature sensors, display differential temperature or set high and low temperature limit alarms – it’s pretty good value for money! 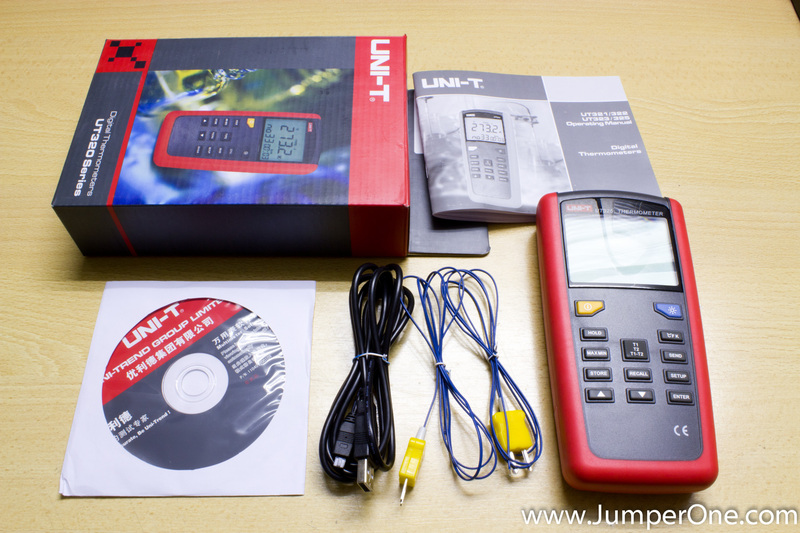 If you looking for logging thermometer with TWO thermocouple inputs – then UNI-T UT325 is completely worthless! Also, the teardown revealed, that it has pretty good hardware inside, and this device is very hackable. With proper written firmware and PC software it could compete with much more expensive logging thermometers out there! Teardown isn’t fully ready yet. I’ll put it out tomorrow!